We’ve all been gripped by Olympic fever this week, cheering for the equestrian Team GB as they swept the board. While most Olympic athletes have a very brief career, usually retiring in their mid-thirties at most, dressage king Carl Hester is 45, eventing supremo Mary King is 51, and top showjumper Nick Skelton is 55 . If you need any further proof that horse riding is good for you, take a look at Japanese Olympic dressage rider Hiroshi Hoketsu. The 71-year-old is the oldest competitor at the 2012 Games, and made his Olympic debut in Tokyo in 1964. 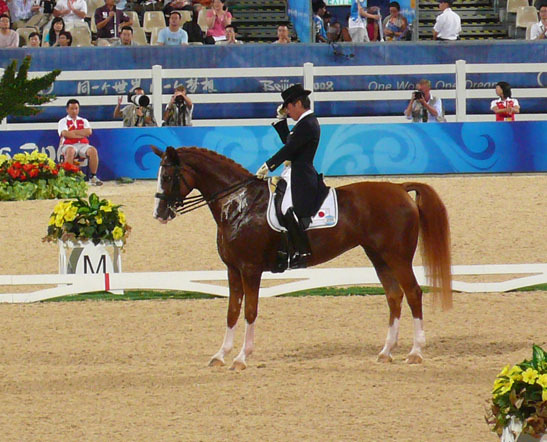 Hiroshi Hoketsu and his horse Whisper, then aged 15, at Bejing in 2008. Photo by TK Steven. Riding is one of the few sports that you can take up later in life, and continue into old age. It’s an excellent low impact activity, great for toning muscles, improving core strength and maintaining balance. Like any sport, it’s more difficult to take it up from scratch at a later age than to start young and continue, but it’s certainly not impossible. Modern training methods mean that older riders can learn to ride on mechanical simulators in perfect safety, and build up the required muscle tone and balance before risking their new skills on a real horse. Many years ago, I often used to meet a lovely lady out hacking on her elderly chestnut Arab. The lady was probably in her late seventies or early eighties, and the horse in its late twenties. Having not seen her for a few weeks, I bumped into her walking her dog, and she told me that her horse had recently died of old age. When I sympathised about the end of her riding career, she replied, “Oh no, I’m going to keep riding. I’m going to get a youngster and break it in.” Having ridden all her life, she was more worried by the effect that stopping would have on her health than the risk of starting again with a new horse. In her blog Tales of a Middle-Aged Novice, rider Alison Barton describes the challenges of taking up riding later in life, talking about the health benefits, excitement and satisfaction of her new sport with the enthusiasm of the convert. Riding really does have something for everyone – so although you may have left it too late to win an Olympic gold medal, you probably haven’t left it too late to start learning.